Let go of the reigns and let your students take over ~ Sport Education is student centered learning at its finest! Can you let go, are you willing to give up some control (not really, but your students will believe you do), and are you ready to take and risk and have a ton of fun learning with your students? Lets take a look at the sport education model and learn how to implement one of the most exciting units that you will ever teach! It will be the most enjoyable for you as a teacher and your students will never forget it either! Lets take a deeper look at the model and how to implement it into your curriculum this year! Planning and creating materials is the biggest part of kicking a sport education unit off. Once things are planned and created the teacher has a lot of flexibility throughout the unit (that is if things were planned and created properly before the unit starts). Take as much time as you need and make sure to come up with the best plan possible for your situation. 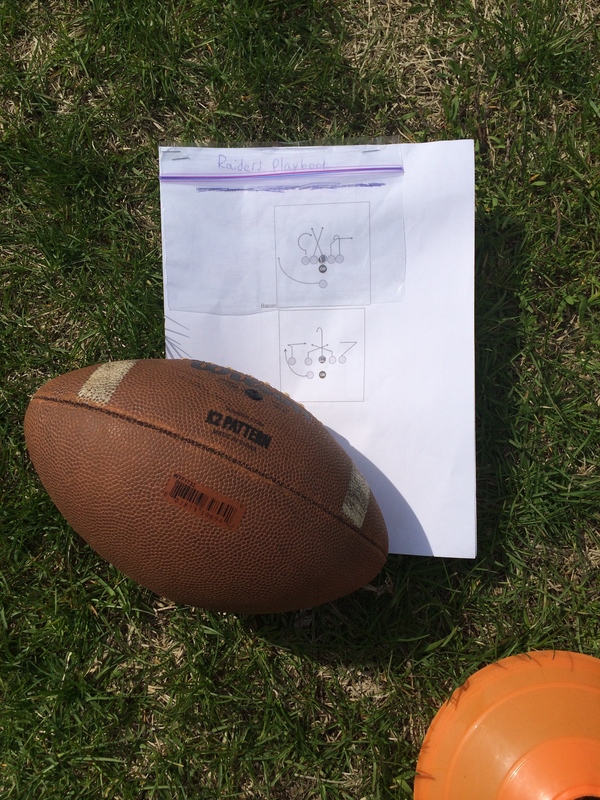 Before I get into the details of what I did for my first sport education unit, the #MustangBowl, I’ll fill you in on some of the resources I used to help me perfectly plan my football sport education season. What does your classroom need? It is key that you don’t just take any of these ideas and just try to implement them into your classroom. You must find the right fit for your classes, so please look at all the resources I am sharing with you, the technology you have, ages of your students, size of your classes, and knowledge of your students. There are so many ways to properly implement sport education into your classroom. It is important that you use the model that fits your situation best. These roles were a good fit for my students, because they offered many different jobs that anyone could learn and enjoy. To help their understanding I made Google folders that I could share with each student, so they could learn more about their job in more detail when they were away from the physical education class. My students used the first 2-3 days of the unit practicing as a team and having job meetings with me, where I would meet with all referees, cheerleaders, etc. Later in the unit they would spend 5-10 minutes at the beginning of each class learning, practicing, fulfilling these roles during their team practices, along with practicing with their team, so they were prepared for the games that would be coming. There were longer practices at the beginning of the season with no games, and then the practices became shorter as we got into the regular season. During the games, everyone played, but still assumed their job responsibilities during the game. The students were able to chose jobs during the first day of class. I was teaching the class by using a TGfU approach, so they could learn strategies and skills together, while being highly active. The TGfU approach is one of my favorite for teaching invasion games. Students would rotate to our 6 iPads and fill out a google form with their top 2 job choices. 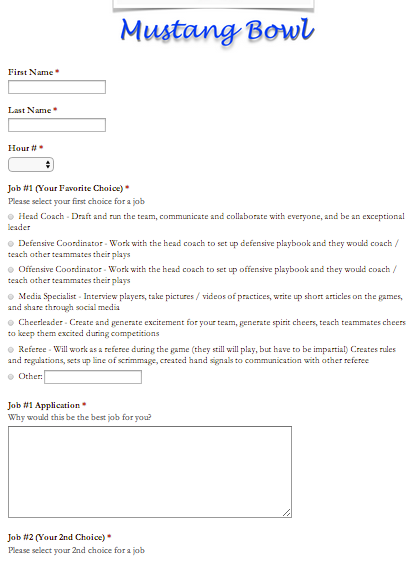 They would be expected to fill out a short resume on why they should be selected for their position. That evening I was able to sort through the responses and assign them their jobs. I was the leader of the lesson again today, so the head coaches could go into the draft room and decide on who they would like to draft for their teams. The four head coaches were alone together in a secret draft room, so no one could hear their discussions. They were responsible for choosing one teammate from each job title. This worked out perfect, because it made the teams ability levels very close. The coaches really liked the fact that they could draft who would be playing for them. I thought that if I picked teams that it would undermine the head coaches role. The last 15 minutes of class coaches were able to meet with their teams and take them through their first practice. To make this official, I wanted to have an ultimate goal of making it to the Super Bowl. 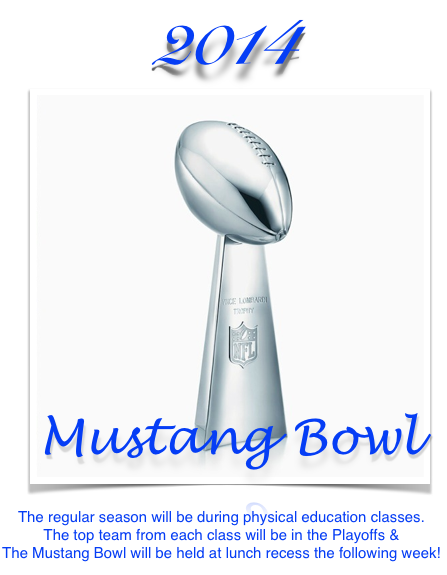 Since we are the Merton Mustangs at school, I called it the Mustang Bowl and used the hashtag #MustangBowl for our media specialists to tweet with. The playoffs would have to be during their lunch recess, so the champions from each class could begin playing each other. All the planning at the beginning of the unit was really paying off, because I was able to have 4 teams per class and I have 8 total classes, which gave me 32 teams (this is the exact same number as the NFL). Each class was given a division and my 8th graders were the NFC and my 7th grade classes were teams from the AFC. This would give me a final match up of the AFC vs NFC in the Mustang Bowl. I wanted to make sure to have a culminating event for the season, so each team had a bigger goal in mind to keep them focused during their classes. I planned a short pre-season, so each team could practice their plays, and attempt them in a game situation. I also wanted teams to use this time to understand and see what other teams were doing (essentially scouting their competition). Then I knew we needed to have an official season. I wanted to have a short practice before each game, so everyone could practice their roles and fulfill their duties. This also gave us just enough time to have a 20-25 minute game. We would play each team in their class during the regular season. The postseason would consist the team with the best record from each class. That would give me 4 playoff teams from my 7th grade classes (AFC) and 4 teams from my 8th grade classes (NFC). They would meet at lunch recess for the playoff games, and the games would last for 15 minutes. Monday of the playoffs would be the 8th grade divisional rounds. Tuesday would be the 7th grade divisional rounds. Wednesday would be the 7th and 8th grade conference championship games. Thursday would be the Mustang Bowl. This ended up being a short week with a Friday off, but if it would have been a 5 day week, then I would have had a Pro-Bowl game. For the Pro-Bowl game, I would have had 2 people voted in from each class, which would have made a 8 player team for the NFC vs. AFC. This was an amazing experience for me as an educator. I was nervous, anxious, exited, and pumped to try my first sport education unit. It was hands down by far the favorite unit for most of the students in my classes. They still talk about it today. I know it wasn’t because it was a football season (I have done many football units that many students were not that excited about). It was great, because it gave control to my students. They became the teachers and the leaders and each student loved that for a different reason. It gave them the opportunity to shine in many different ways and to bond with each other. The only thing that I would change is possibly add a statistician. I think it would have been great to add a job for a mathematician. I also believe that everyone would have loved to known what their season stats were!